Spring Training Ball Parks are small and fun to visit. Ah yes, spring must be really close... Spring Training Baseball heralds that every year, and we try to make at least one game most years. Especially this year when our San Francisco Giants are World Champions! Travel doesn't have to be a long trip to an exotic destination... we love a long weekend getaway. 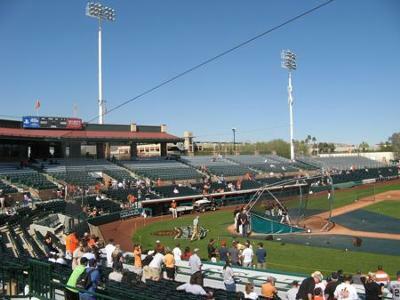 The Cactus League in Phoenix Arizona is a short flight away from us. Spring training baseball parks are small and fun to visit. Most teams have tickets available on the day of the game on weekdays. Weekends can be a little more difficult, but if you know you want to go, you can buy tickets online for the team you want to see. You can visit more than one ball park to see various teams if you like. We had no problems getting good seats on a Friday morning... even for the World Champion Giants. 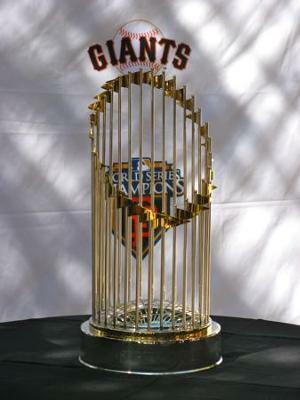 It was a beautiful 80 degree day, the World Series trophy was there and the Giants won. What could be better. You do have to be prepared for cool weather. Even Phoenix can get rainy and cool in the winter.... one year we were even rained and snowed out! 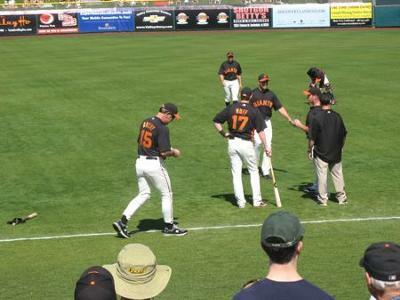 Even though they call it Spring Training, it does start when it is still winter according to the calendar. You don't have to restrict yourself to just baseball... Phoenix has lots to offer. There are good museums, great restaurants, golf, hiking or just lazing by a pool. And while we're talking about the Cactus league, don't forget that half of the baseball teams hold Spring Training in Florida... the Grapefruit League. And Florida has tons of things to do besides baseball. 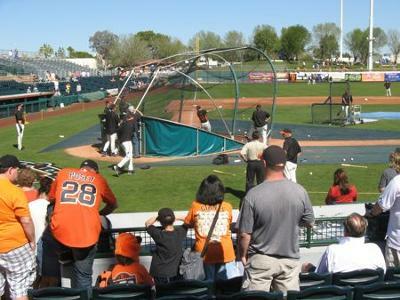 Between the two, a baseball Spring Training game is a short flight or drive away for many fans across the USA. We combined our quick trip to Phoenix with another love... Antique airplanes at the Cactus Fly-in in Casa Grande about an hour south of Phoenix... and at the Pima Air Museum in Tucson. Travel doesn't have to be a long expensive trip... even if it's just a long weekend, travel makes you feel better.